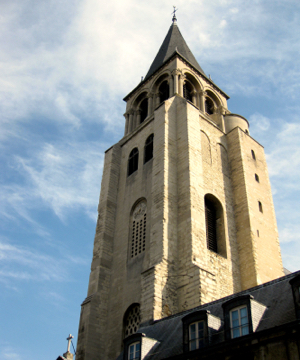 The oldest church in Paris (11th century) is among its most beloved. Its name evokes all the romance of the Left Bank and the Latin Quarter. Right next to the Saint-Germain-des-Prés Métro station on Boulevard Saint-Germain (map) is the Église Saint-Germain-des-Prés. There was a church on this spot before Rome fell to the Visigoths, but this early Parisian church was destroyed by Vikings in the 800s. The Romanesque interior of the Église St-Germain-des-Prés was restored during the 19th century, to the taste of the times, which is different from what was in the original church (though the lighting is a lot better now.) In 2018, extensive renovation and cleaning returned the lovely transept to its former glory. Across the parvis (area in front of the church) and Place Saint-Germain-des-Prés are two of the Latin Quarter's most historic and famous (and now expensive) cafés: Les Deux Magots and Le Café de Flore. 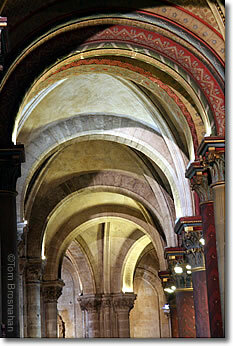 Romanesque interior—well lit— of the Église Saint-Germain-des-Prés.